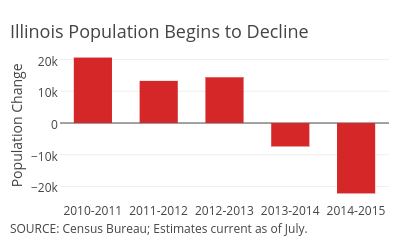 Most states are gaining residents, but a few have lost population in recent years. None are seeing major losses, but it looks as if some states' populations will continue to stagnate or slowly decline in the years to come. The latest U.S. Census Bureau estimates indicate that the nation’s overall population grew by about 2.5 million over the 12-month period ending last July. The reason some states are experiencing population loss vary. Some have weak economies and are losing workers who seek opportunities elsewhere. In others, growth is held back by an aging population. A growing number of people are choosing to leave the Land of Lincoln. Illinois lost an estimated 22,194 residents in 2015, by far the largest decline of any state. The losses, which accelerated from 2014, are partly driven by the state’s economy and a labor market that’s weaker than most other states. Fred Giertz, a University of Illinois economist, said he suspects some job seekers are opting to retire early and move to warmer climates. Much of the state’s economy, outside of the Chicago metro area, is tied to either manufacturing or agriculture -- two sectors that aren’t generating many jobs. Illinois’ net migration rate (-5.2 per 1,000 population) was lower than all other states, with the exception of Alaska. One might be tempted to link the population losses to the state’s fiscal woes. Giertz, however, said he doesn’t think that it’s leading residents to move out -- at least not yet. West Virginia’s population has remained relatively flat for decades, and that isn’t likely to change anytime soon. The state fared better economically than most of the country during the Great Recession, enjoying small population gains as a result. More recently, though, the state has recorded slight declines in each of the past three years. 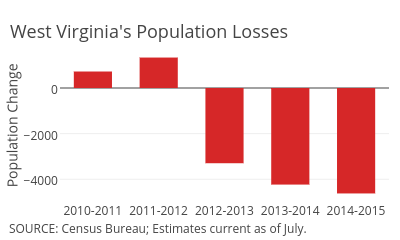 Last year, West Virginia suffered the largest year-over-year percentage loss (-0.25 percent) of any state. One major driver of that decline has been the state’s hard-hit coal mining industry. An expanding natural gas sector has helped, but job creation hasn’t met expectations or offset coal mining losses, said Christiadi, a West Virginia University demographer and economist who goes by one name. Economic opportunities and wages are frequently more attractive elsewhere, prompting workers to leave, said Christiadi. A net total of more than 27,000 people (up from 17,000 in 2013) migrated out-of-state each of the past two years. Compounding matters is the fact that the state’s population is one of the nation’s oldest. West Virginia and Maine were the only two states where deaths exceeded births last year, according to Census estimates. 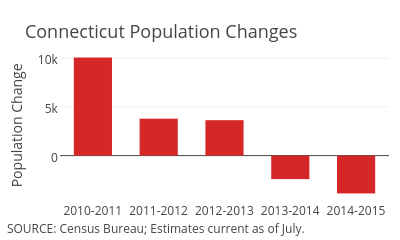 A sluggish economy has played a large role in holding back Connecticut, which experienced slight population losses each of the past two years. Domestic migration losses have accelerated, with the state losing a net total of about 27,000 residents each of the past two years -- up from 17,000 in 2013 and 19,000 in 2012. Fred Carstensen, an economics and finance professor at the University of Connecticut, attributed the uptick to a lag effect from mostly long-term unemployed workers choosing to leave the state for job opportunities. “It took people a while to get their arms around the reality that things were not going back for them,” he said. Many relocated workers are likely young professionals who either can’t land their first jobs in Connecticut or leave the state for promotions. Downsizing in the pharmaceutical industry, along with casinos facing more out-of-state competition, have hammered parts of the state. The southwestern region has generally fared better, but General Electric announced last week that it plans to relocate its corporate headquarters from Fairfield County to Boston. 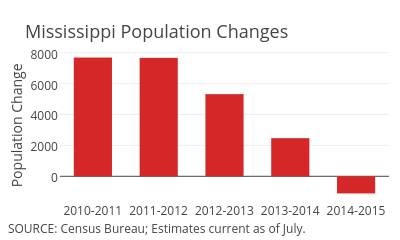 Mississippi’s population totals also appear to be trending in the wrong direction. The size of the state’s gains had been shrinking each of the past few years, before registering a slight drop in 2015. The primary cause of the state’s stagnant population is the growing number of residents who are moving elsewhere. Mississippi suffered the fourth steepest loss in terms of total net migration (-3.2 persons per 1,000 residents) of any state between 2014 and 2015. Natural change from childbirths offset most of the losses. By comparison, neighboring Alabama (+12,568), Arkansas (+11,369) and Louisiana (+21,734) registered annual population increases more in line with the rest of the country. Maine and Vermont face similar demographic challenges. The two northeastern states have the nation’s two oldest populations in terms of median age, so they’re not seeing many births. At the same time, their residents are moving to other states as well. Vermont recorded a year-over-year net loss of 2,223; Maine lost an estimated 1,718 residents to other states. And while other states offset domestic population losses with increases in international migration, Maine and Vermont haven’t seen the same influx of the foreign born. After growing over several decades, both states are now experiencing only slight fluctuations, with population changes of generally fewer than 1,000 residents each year. In the coming years, their population growth will likely remain stagnant. New Mexico also lost population -- an estimated 458 residents -- essentially unchanged from 2014.